Toronto Inspires when passion and perseverance intersect. You’d be hard-pressed to find an aspiring runner in Toronto’s High Park community that hasn’t received an encouraging nudge from neighbourhood running coach Paul Miller. After all, during the past decade or so, he has guided close to 2,000 race-completion hopefuls at the local Running Room. His training clinics are consistently packed-not only because he is a remarkably dedicated coach, but also because his own transformational story resonates. In 2001, Paul’s comfort zone was better visualized as a sectional sofa than a patch of pavement. That was about to change. In April, an ex-girlfriend talked him into keeping her company by joining an upcoming Learn to Run clinic. 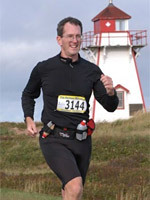 Ten weeks later, after persevering with the program, in spite of running in cut-offs and cross-trainers, he and Gina crossed the 5K finish line at the Nissan Toronto Challenge in 0:36:37. Reflecting back, he recalls describing running “five whole kilometers” to a neighbour as unbelievable. That was also about to change. Read more about Paul! 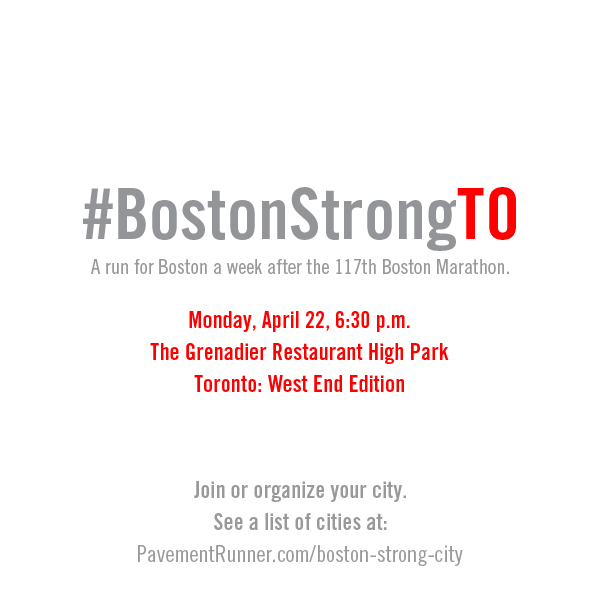 Toronto Inspires when local runners band together in support of all Bostonians, residents and runners alike. Please join your local running community. As always, it is a sport in which all are welcome! 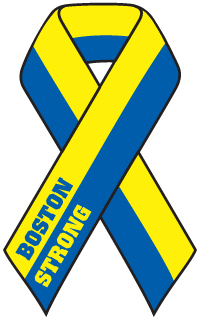 Inspiration Takeaway: Community fosters strength. Toronto Inspires when the 75+ years-young runner and coach, Stephen Bogardo, handily wins his age category, while simultaneously trumping two-thirds of the entire field of 2,800 half-marathon racers. With a stand-out finishing time of 1:54:18 at the recent Burlington, Chilly Half Marathon, running clinic coach Stephen Bogardo can’t help but instill awe in those attending his results-focussed running clinics and other mere mortals. It should be no surprise that he’s ranked among the top North American runners in his age group. It should also be no surprise that he has coached many aspiring racers, of all ages, to attain their personal bests. Enter your email address to follow Toronto Inspires and receive notifications of new posts by email.